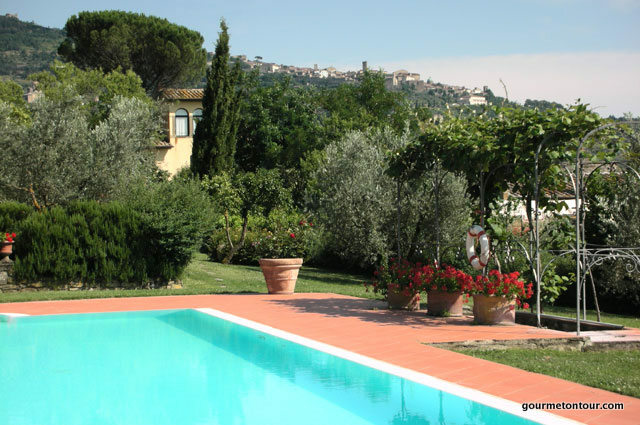 Your home for the week is a 17th century family residence near Cortona – location for the movie of Frances Mayes’ “Under the Tuscan Sun”. Set amongst vineyards and olive trees that surround the small Etruscan hill top village, this is the perfect locale for unforgettable cooking vacations in Tuscany. 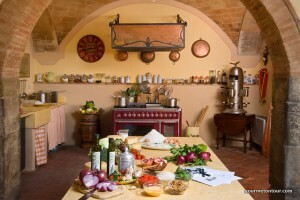 Enjoy hands-on cooking courses with our cheerful Michelin-starred chef, market visits, wines and superb Tuscan countryside. Our estate is on the foothill of the small charming town Cortona in the Valdichiana region in southern Tuscany. The city, enclosed by stone walls dating back to Etruscan and Roman times, sits on the top of a hill and offers a spectacular view of the surrounding valley and rolling hills towards Lake Trasimeno. 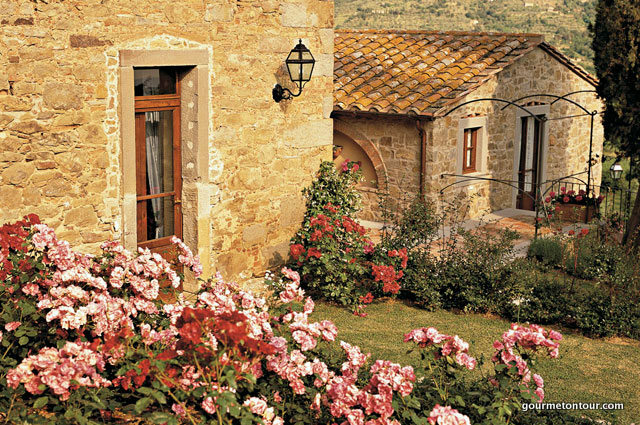 Plenty of hilltop villages can be explored from here and Perugia, Assisi, Pienza, Montepulciano and fabulous designer shopping outlests are just at your doorstep. 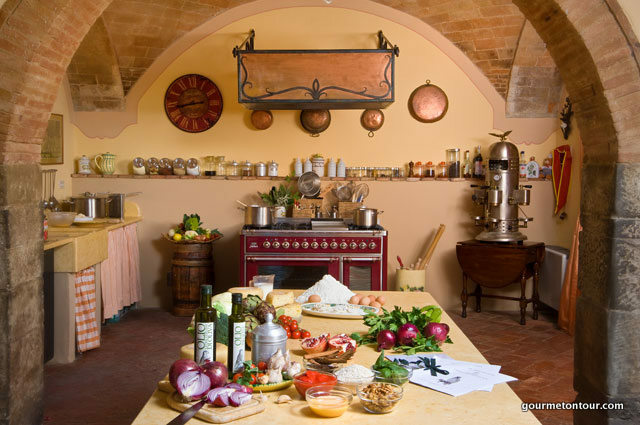 During a three- or six-night stay you will learn to cook and present traditional and innovative Tuscan dishes with our Michelin star chef. 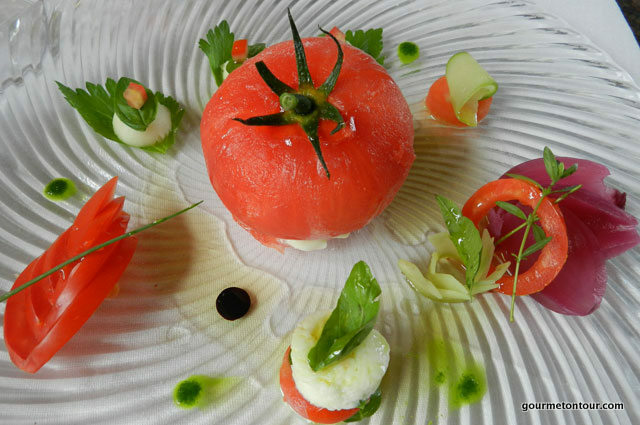 He will guide you through culinary tricks of a gourmet kitchen. 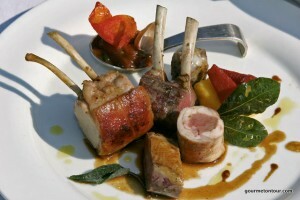 The owner is a professional sommelier so will have the opportunity to learn from her about food and wine pairing. Menus are carefully chosen to complement eachother and change depending on the season. 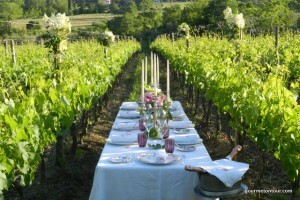 The pasta is homemade, the olive oil is produced from the Relais’ own trees, and grapes from the vines may feature in some of the dishes. 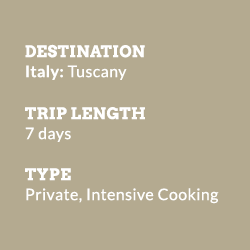 The owners will personally oversee your culinary week and guarantee that you get to know authentic culture of Tuscany and enjoy an experience of a lifetime. 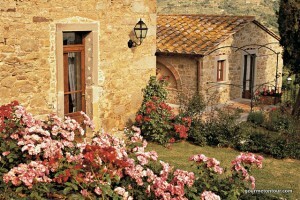 This elegant residence, built in 1600, was home to poet Antonio Guadagnoli in the XIXth century. Today, our luxury boutique hotel, which retains all the splendor of its historical past, has been magnificently restored. 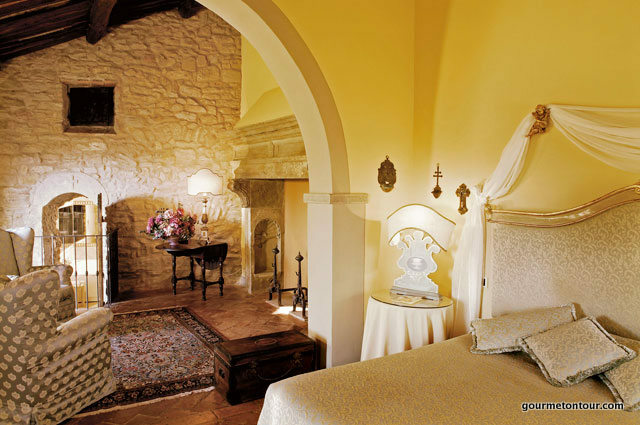 13 guest rooms and 6 suites enjoy panoramic views and original antique furniture with iron poster beds. 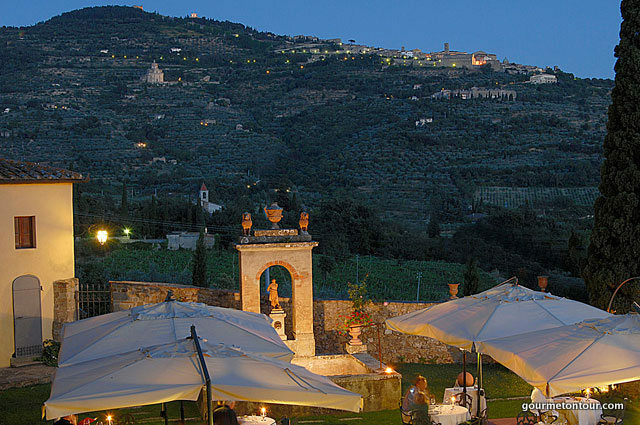 In addition to the gourmet restaurant, there is an outdoor terrace surrounded by beautiful cypress trees and a chestnut-lined garden where you can enjoy fine Tuscan wines or pre-dinner cocktails. 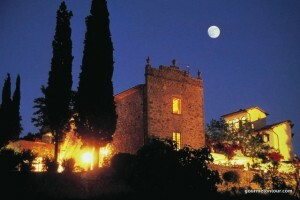 3 and 6-night programs available year-round, minimum 2 guests. 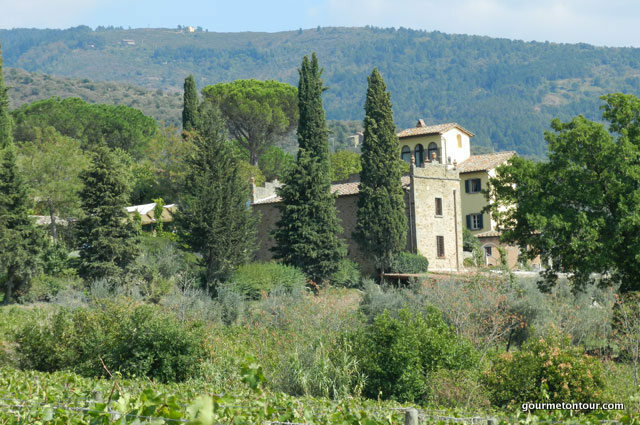 Harvest and olive months of September & October: What better occasion to visit the villages of Tuscany and above all taste Tuscan wines and oil famous all over the world. In September, the Tuscany comes alive with festivals relate to harvest grapes and opens its cellar, filling the streets with music and typical products. The traditional annual grape harvest, by the end of August for the red grapes that ripen earlier, and continues until October for the white grapes that ripen later. Wine in the Kitchen? A valuable ingredient to achieve amazing results and dishes full of aroma. From cakes to braised meats, fish to desserts. Complimentary entrance to the Thesan Spa, Aqua & Vapori circuit. We recommend to rent a car or we will be happy to arrange transfers from airports or train stations. “It was fantastic! We all had a great time. It felt very, very special! The pacing was perfect. The classes were wonderful (Chef Richard cooked with us for all three meals). They accommodated our preferences (and a food allergy) and we made amazing dishes that we really will be able to cook again. Silvia and Riccardo were very hospitable and gracious. The wines were great. “We had an extremely enjoyable stay with Il Falconiere. The overall experience was nothing short of excellent. Sylvia took the time to sit with us on the first evening and run through the suggested itinerary. She was eager to hear our own thoughts, and to understand what we wanted to take away from the experience including anything that we wanted to add in or take out. In short, nothing was too much trouble and we ended up with a completely customized experience. The quality of the food in the restaurant was staggering. We often eat in nice restaurants and our expectations were high, however the quality of the food and the impeccably matched wines selected each evening by their friendly and knowledgeable Sommelier, Gianni, blew us away. I don’t think I’ve ever eaten so much in a week! Gianni also took us on an impromptu tour of the winery before teaching Shari how to open a large bottle of their sparkling wine with a large knife! In short, we were treated like family from the moment that we arrived. We ate and cooked some of the best food I’ve ever eaten and all using locally sourced fresh produce. Everything that we wanted from the holiday was wonderful and truly enjoyable. Thank you for all your help in arranging a wonderful vacation for our family! Everyone, including our kids, had so much fun.